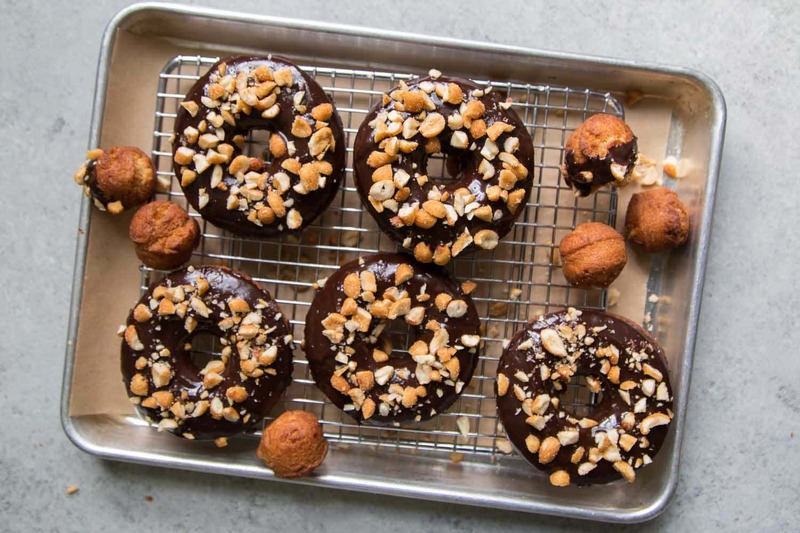 These peanut butter cake doughnuts are dipped in dark chocolate glaze and topped with chopped honey roasted peanuts. It’s a rich and decadent sweet treat that pairs wonderfully with a tall glass of milk! Typical peanut butter cake doughnuts use a plain dough. The only peanut butter comes from the glaze. 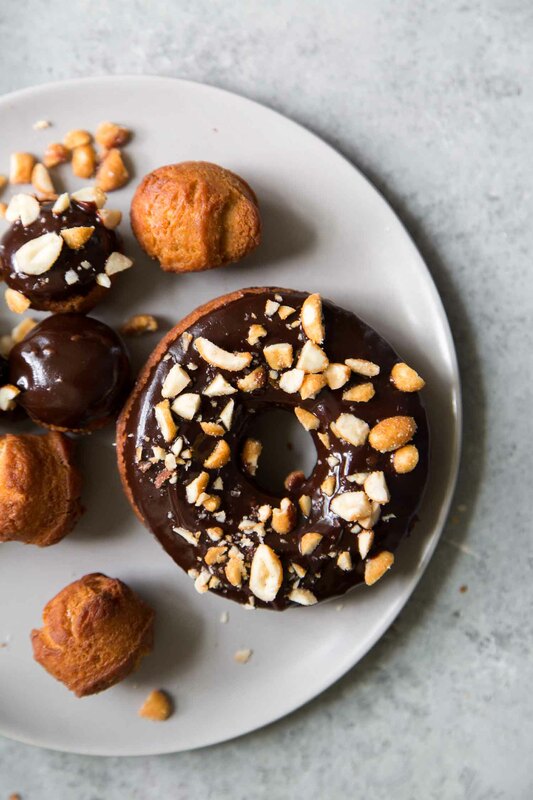 Let’s upgrade that standard doughnut and bring it up a notch. 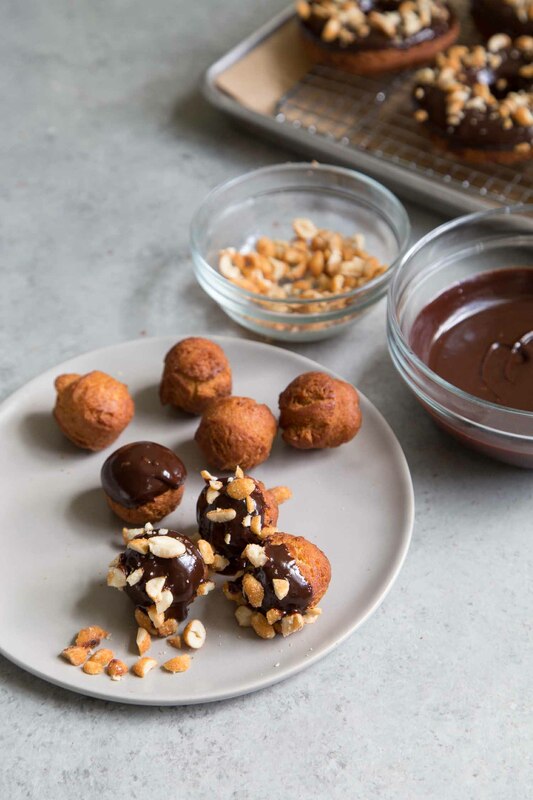 In this recipe, peanut butter is mixed into the dough to ensure that you can clearly taste that iconic smooth, nutty, rich flavor. 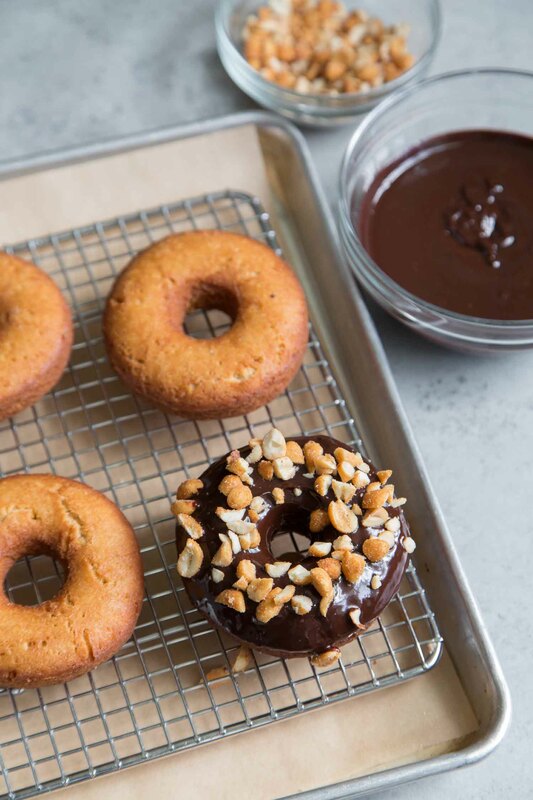 While most of the other doughnut recipes I share are a bit time consuming and labor intensive, these are not! These are by far the easiest fried doughnuts I’ve made. The dough is mixed together similar to the way you make cookie batter. Cake doughnuts are a bit more dense in texture compared to light, fluffy yeast raised doughnuts. Cake doughnuts rely on baking powder as a leavening agent. Without the addition of yeast, the resulting crumb is much tighter and compact. The chopped honey roasted peanut topping adds a nice textural crunch. 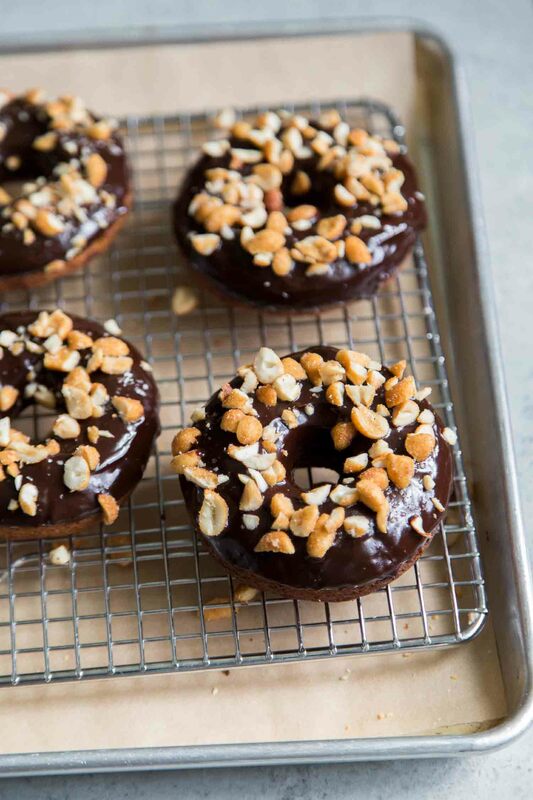 Best of all, the sweet and salty peanuts harmonizes with the dark chocolate glaze. I’m a big fan of peanut butter chocolate combinations. The team just works well together in so many applications: chocolate dipped peanut butter crinkle cookies, chocolate peanut butter oat tart, chocolate peanut butter cookies. In the bowl of a stand mixer fitted with a paddle attachment, beat together peanut butter and sugar until well combined. Scrape down as needed to ensure thorough mixing. Add egg and mix until incorporated. In a large bowl, whisk together flour, baking powder, baking soda, and salt. Add dry mixture to mixing bowl in three additions, alternating with buttermilk. Start and finish with dry mixture. Mix on low speed until dough has formed and there are no longer any dry streaks of flour. Scrape out dough and place on a parchment lined baking sheet. Roll out or pat dough to about 3/4-inch thickness. Cover with plastic wrap and let chill in the freezer for 15 minutes. Meanwhile, add about 3-inches of vegetable oil (or shortening) to a heavy bottomed pot (Dutch oven and cast iron pans work best). Attach candy thermometer to pan. Set over medium heat until oil reaches 350°F. Remove chilled dough from freezer. 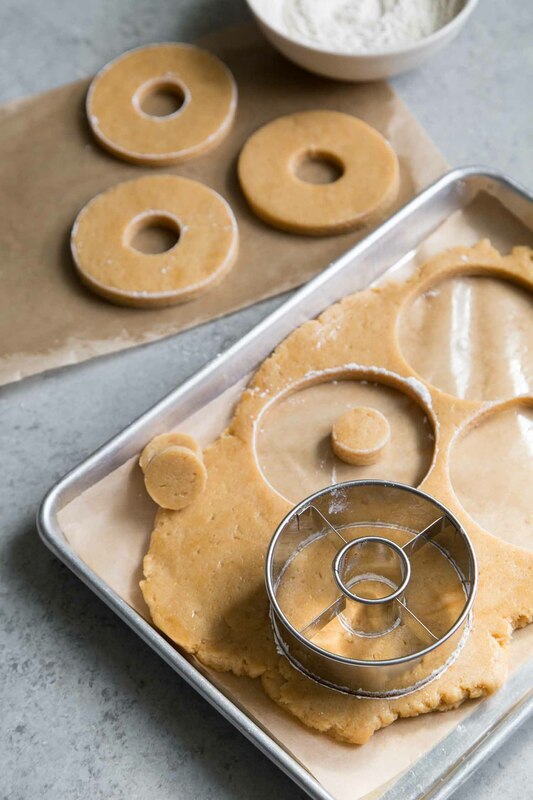 Use a floured 3 1/2-inch doughnut cutter (or 3 1/2-inch round cutter and 1-inch round cutter) to punch out as many doughnut rings and doughnuts holes as you can. Gather up the scrape and re-roll dough up to two times to punch out additional rings and holes. Place finely chopped chocolate a heat safe bowl and set aside. In a sauce pot, combine milk, cocoa powder, corn syrup, and sugar. Set over medium heat and bring to a boil. Once boiled, remove from heat and immediately pour over chocolate. Allow mixture to sit undistributed for about one minute. Use a spatula to stir together contents until smooth. Dip one side of cake doughnut into chocolate glaze. Top with chopped honey roasted peanuts. Serve immediately, or allow chocolate glaze to set up before enjoying. Doughnuts are best served the day they are fried. 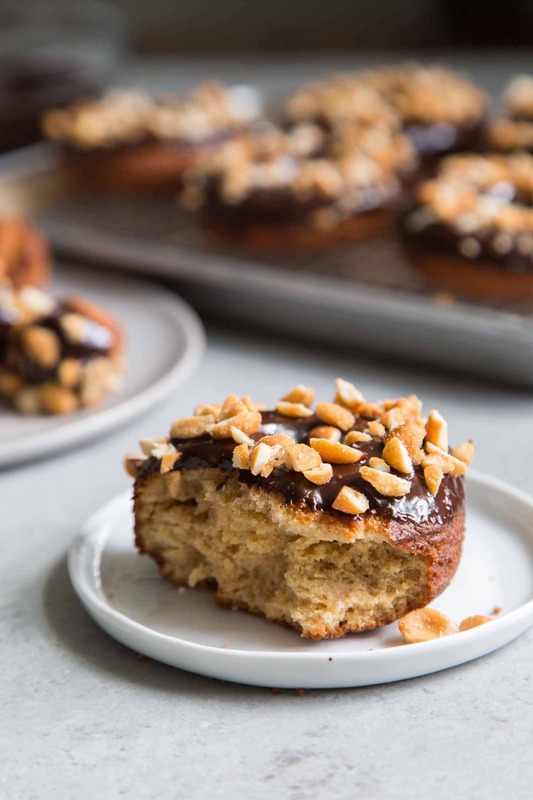 The peanut butter cake doughnut recipe works best with homogenous peanut butter like JIF or Skippy. These peanut butters tend to be sweetened and salted. Natural peanut butter (those that require stirring before use) may separate from the dough when being chilled. If using natural peanut butter, you may also have to increase the amount of sugar in the recipe. I have such a weak spot for doughnuts and then you had to go and throw in peanut butter into the mix. Wow, wow, wow! These looks amazing! !